Stay min 7 nights, get %10 Save! Discover the Klas Hotel İstanbul! The right place and location to live the city of many civilizations, İstanbul today, through the ages. 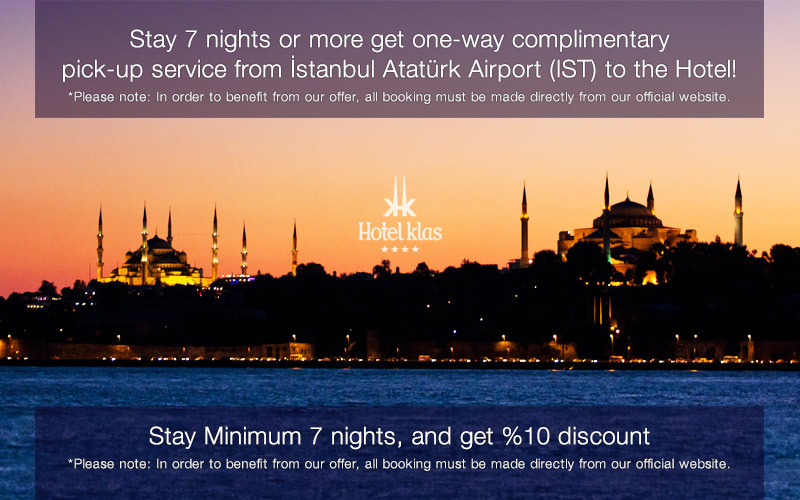 Klas Hotel Istanbul is a deluxe 4 star hotel, with its 129 rooms is at your service of Turkish Hospitality. The luxurious Klas Hotel combines ultra-modern and stylish accommodation with an excellent location in the centre of İstanbul, Laleli area, within walking distance to most of the city's major attractions. An easy walk through the streets of this fascinating city will take you to places such as the Grand Bazaar, the Blue Mosque, Hagia Sophia and Topkapi Palace. The main campus of the İstanbul University – on Beyazit Square – is right next to the hotel. The rooms of Klas Hotel impress with their design and soothing ambiance. They are all equipped with minibar, satellite LCD TV, free Wi-Fi, safe. The Executive (balcony & jacuzzi) and Deluxe rooms offer extra space and extra comfort. Taste delicious Turkish and international cuisine at Tulipa Restaurant. For relaxation, enjoy your favorite drink at the terrace bar by our outdoor swimming pool or enjoy our sauna! Book & Save Now Online! “I stayed at Klas Hotel for 4 nights and it was excelent. Great value for money! Rooms are big enough, very clean and well appointed with a very modern design and large windows that you are able to open to enjoy the fresh air. Breakfast is a very wide selection of cold cuts, cheese, bakery fresh fruits and vegetables etc. You can find even a type of soup wich is very tastefull.